Thanks for choosing PanFone iOS Eraser! Let's start to get familiar with it from now on! 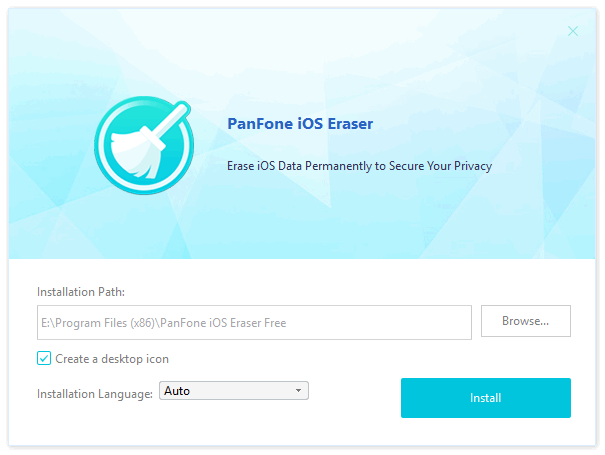 Learn how to install PanFone iOS Eraser and some basic information about PanFone iOS Eraser. Once you have finished downloading PanFone from our site or other places, it's easy to finish installation following the instructions. Step 1. Locate and launch the downloaded .exe file to start the installation wizard. Step 2. Click on Customize Install, you are allowed to select installation path and language. Then click on Install button. Step 3. After a while, PanFone iOS Eraser will be installed successfully. Click on Finish button or Start Now to launch the application. Now, let's learn how to use PanFone iOS Eraser. 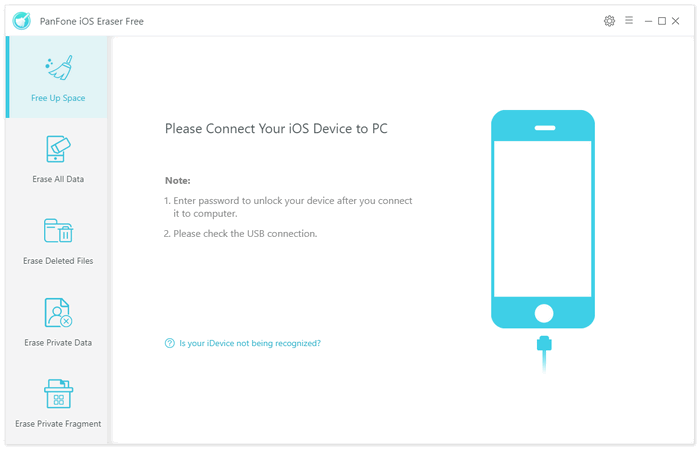 To start with, run the program and connect your iOS device (iPhone, iPad and iPod touch) to your computer via an USB cable. When your devices are connected and recognized by your program, your devices will show in the window as follow. 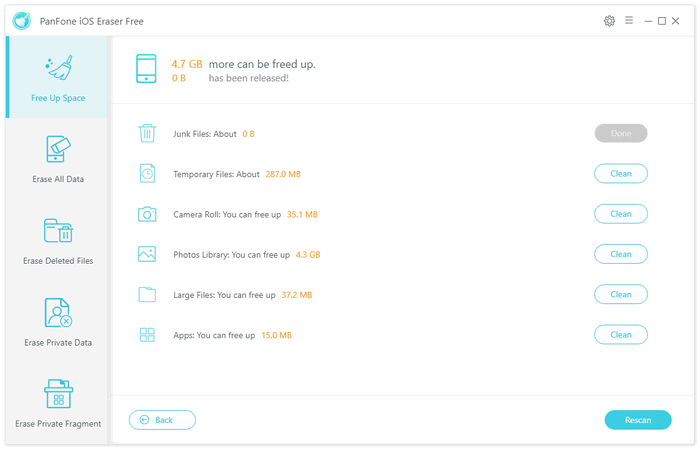 You can simply click on Quick Scan to do a full scan of your device, or you can click on each option including Junk files, Temp Files, Camera Roll, Photo Library, Large Files and Apps to scan. After a while, PanFone will finish scanning your device and list scanning result on the panel. 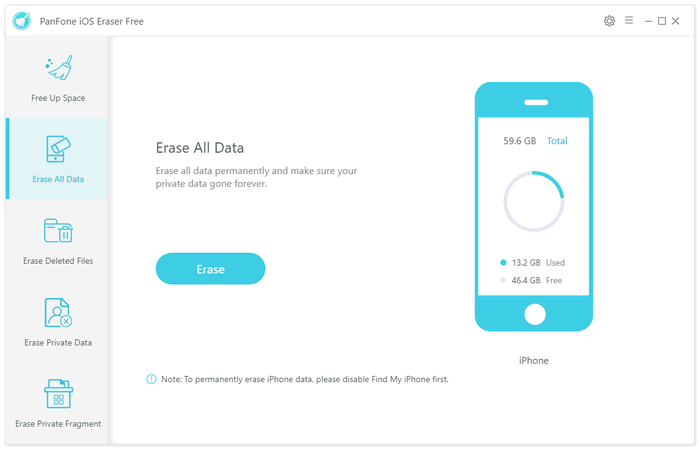 You can choose to clean your desired data to free up space on your device. Of course, you can go Back or do a Rescan. Firstly, run PanFone iOS Eraser and select Erase All Data mode on the main interface. Connect your iOS device to the computer with an USB cable, and simply click on the blue button Erase. 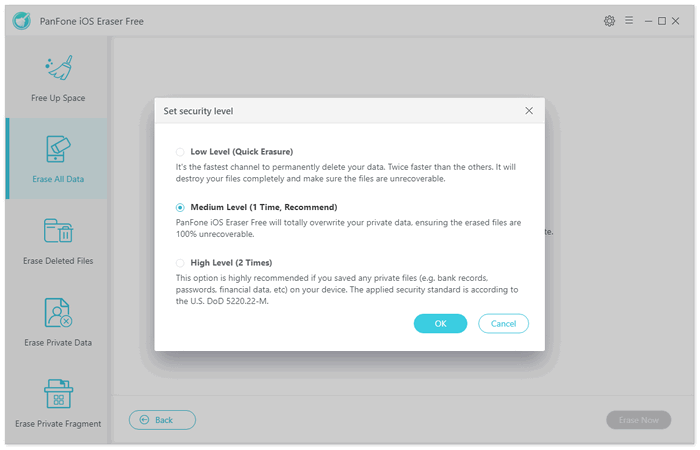 Read the 3 tips before erasing data, and you can select a security level. The default recommended level is Medium, and there are other two options: Low Level and High Level. Simply select your preferable one. 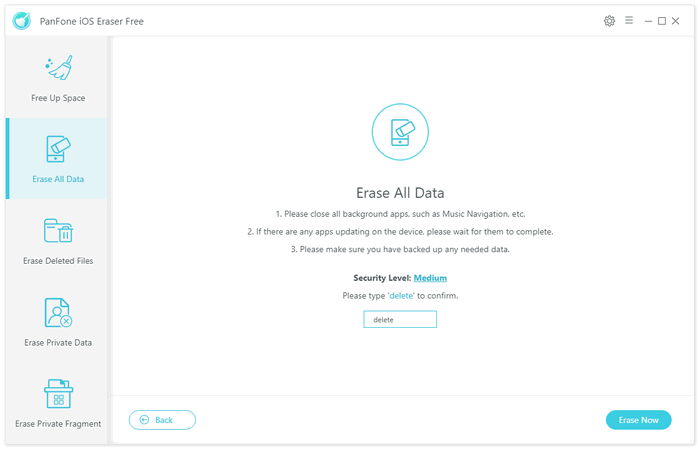 To avoid you from erasing your data by mistake, you need to type the word Delete manually before erasing all data, enter the right characters, and click on Erase Now button.